For many, the name Hatteras is synonymous with fisherman, so well- known is it among hobbyists all over the world for its production of sportfishing convertibles. 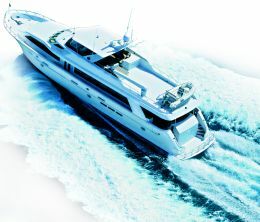 A Alongside its well-established range of fishing machinery, however, the American shipyard also produces motoryachts, of which it now has 6 models, from 63' to the biggest, 92 and 100 feet, the latter being also available in the "Cockpit" version, which features a cockpit astern specially designed for fishing. SNO Yachts; Cala Saccaia, Zona Industriale settore II; 07026 Olbia (SS); tel +39 0789 596174-5; fax +39 0789 596732; e.mail info@snoyachts.it; siti web www.snoyachts.it - www.hatterasyachts.com. 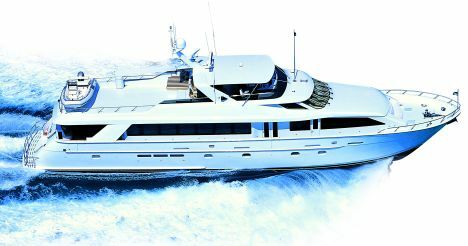 The flagship, which we present here, is still the 100M/Y, a boat with a beauty all of its own, not greatly influenced by current trends but rather characterised by its spacious interior to meet the needs of customers who, even with such large boats, still seek maximum comfort and utility in each space. 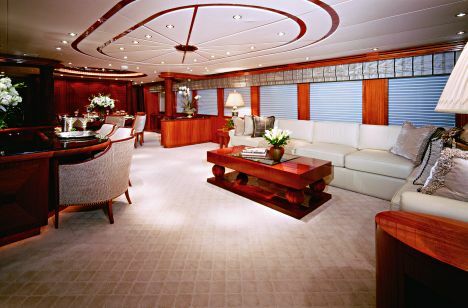 An example of this is the lounge on the main deck which is a real party lounge, divided into a living area with built-in bar on the port side, equipped with fridge and ice maker, and a dining room for entertaining. 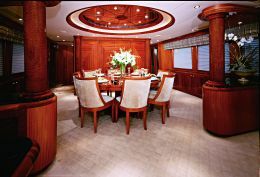 As regards the furnishing of the entire area, Hatteras always leaves freedom of choice to the owner as regards type of furniture as well as materials and upholstery, so it can be absolutely personalised and custom designed. The area is fully equipped with accessories, however, to increase the comfort of guests including a plasma 42" T.V., a stereo with CD player, DVD player and a powerful air-conditioning system which has been especially installed to ensure a uniform temperature in all areas. 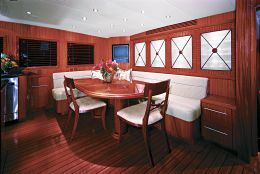 The galley, in line with American tradition, is fitted out with every accessory. 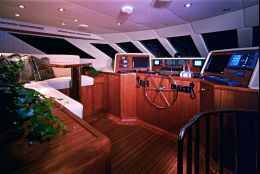 Located forward of the stairs to the sleeping area and the "pilothouse", it is equipped with two freezers including icemaker, a cooker top with four rings and a traditional oven or dual conventional and microwave oven. In addition, therès a waste unit, garbage press, dishwasher, wine refrigerator and a fairly large space for storing, comprising a sideboard and cupboards. The area is completed by a dinette for informal eating with L-shaped sofa. 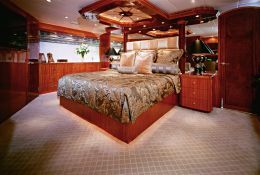 The lower deck is entirely given over to sleeping quarters, with a particularly spacious and richly decorated owner's suite, with adjoining private study, dressing room and double bathroom, divided in the centre by a Jacuzzi. Forward there is a VIP stateroom, accessible only from the bridge house to guarantee maximum privacy, also fully decorated and equipped with a large bathroom. Astern, just before the engine room in the standard version there are another two double cabins, practically identical in terms of size and facilities, which on the owner's request can be "converted" into cabins with twin beds or into one single large suite astern. Master and crew have their quarters astern, separated by the rest of the sleeping area by the engine room and these are also only accessible from the outside. Here there may be two or three cabins on request, served by two bathrooms. On a middle level between the main deck and the flybridge, is the raised pilothouse or control station in a dominating position to guarantee maximum sailing visibility but without stealing precious space from the upper deck which is entirely given over to an outdoor life. 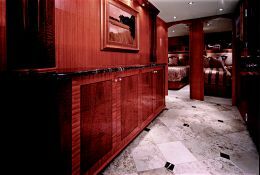 Here there are two L-shaped dinettes, one on each side, with a handy bar at the bow with icemaker, fridge and sink and with a large central Jacuzzi astern. Still further towards the stern is enough space to house the tender and the relative accessories for movement.